I really love playing host, but let’s face it, some nights I just want to keep things simple. Here’s a great menu for a casual evening among friends, where we’ve put down our saffron and beurre blanc and picked up only the most basic ingredients: salt, pepper and olive oil. You’ll be amazed at how satisfying such an elementary meal can be. Preheat your oven to 400°F and place the top rack in the lower third of the oven. This will be your chicken oven. Preheat a second oven (even better, your toaster oven) to 450°F. Place the bratwurst directly on your oven rack or on a wire rack in the oven and bake for about 5 minutes until the top side has browned. Flip the links and brown for another 5 minutes. Turn the heat on your brats (long “a” sound) down to 200°F and let them continue to roast, turning occasionally, until you’re ready to eat (or about an hour and a half). Truss the birds and salt liberally. Pepper them to taste, then rub the skin with oil. 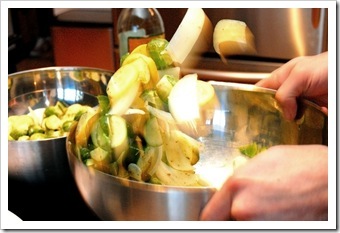 The oil will add flavor, but also act as a conductor to help us in our quest of an all-over tan. Preheat 2 large skillets [may I recommend cast iron] over high heat until they have just started to smoke. Place one bird in each skillet, breast side up. Transfer the skillets to the oven 400°F and place side by side. Roast for 45 minutes to 1 hour, or until a thermometer inserted into the breast reads 150°F. After the birds have rested for 10 minutes, carve them into quarters and place on a large platter. 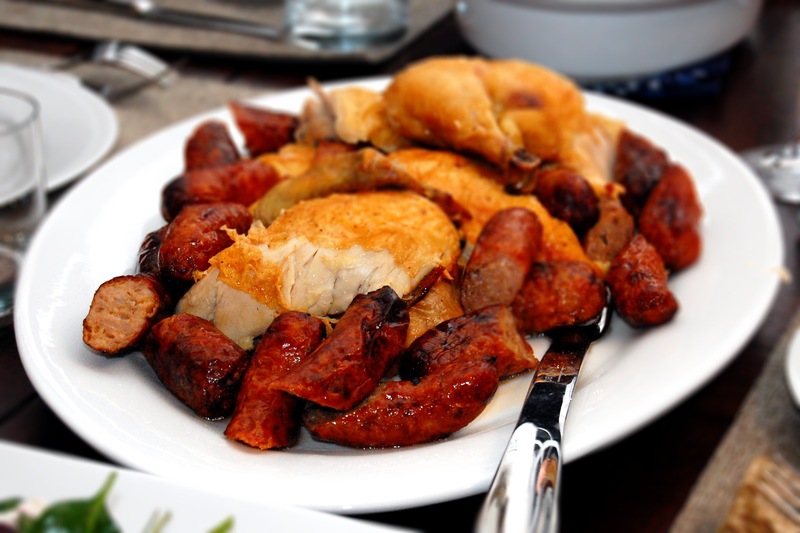 Cut each bratwurst in half on a bias and place around the chicken. Serve to an adoring crowd. 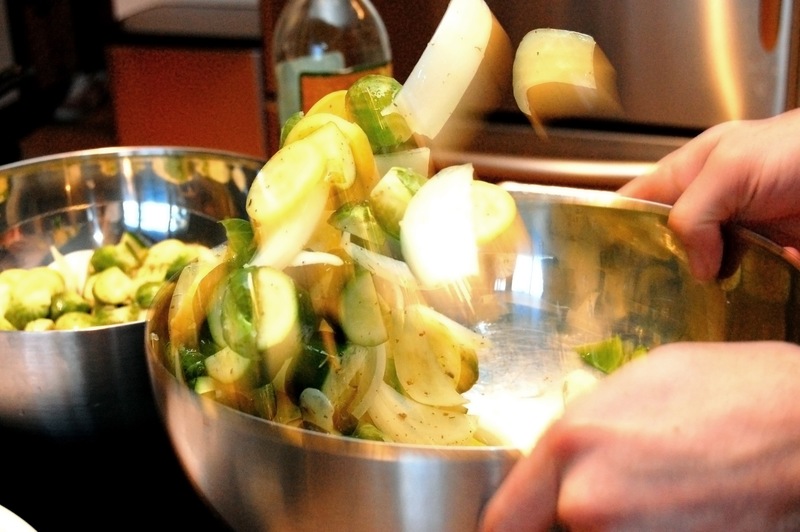 For the roasted vegetables, chop yellow squash, zucchini, brussels sprouts and onions into 3/4″ chunks and toss with olive oil, kosher salt and pepper. Roast on a baking sheet at 400°F for 25 minutes, or until golden brown spots of deliciousness appear. 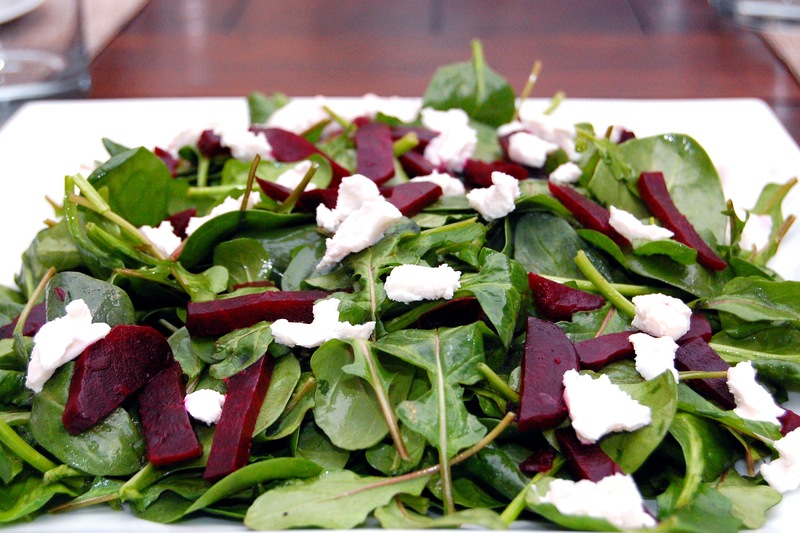 Round out your meal with a light beet and goat cheese salad. Toss arugula and baby spinach with high quality olive oil, champagne vinegar and salt and pepper in a large bowl. 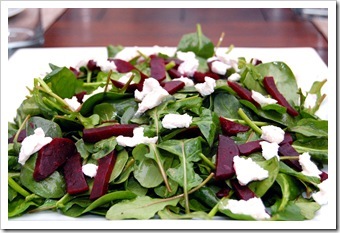 Top with crumbled goat cheese and sliced, boiled beets. 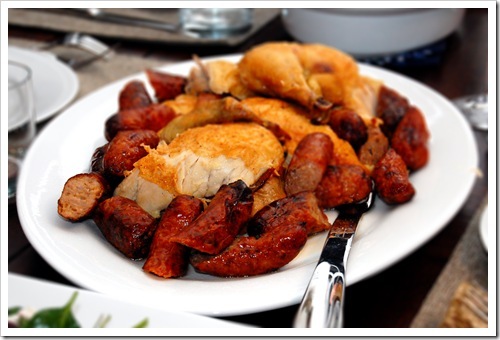 Serve this meal with a sweet wine such as a Gewürztraminer or an Alsatian Riesling. You’ll look like a culinary hero, but for you, this was just “whipping something up”. Bravo. Sign: umsun Hello!!! rcuwwymhyw and 7142ssgfhphzye and 9927I love your site. 🙂 Love design!!! I just came across your blog and wanted to say that Ive really enjoyed browsing your blog posts.